The recent outbreaks of measles and mumps across the country have been linked to communities and families that claim a religious exemption to the vaccine and to “anti-vaxxers” who claim a link between the vaccines and autism. States then began adding “religious exemptions” to the vaccination laws. Currently, California, Mississippi and West Virginai are the only States that do not allow a religious exemption to vaccination. Then came some pseudo-science reports linking vaccines to autism. Even though doctors and scientists have repeatedly shown that there is no such connection, many States started adding a “Strongly held personal belief” exemption to vaccinations. 18 States (NY is not one of them) have such a “philosophical exemption” clause. But several States have declared a public health emergency due to outbreaks of these formerly-gone diseases and they are considering eliminating the religious exemption to force parents to vaccinate their children if they want them to go to public schools or enter public areas. NYC just passed such a regulation after a huge outbreak of measles in the Hasidic Jewish community in Brooklyn. NY Governor Andrew Cuomo has constitutional concerns over a pending bill that would eliminate parents’ ability to avoid vaccinating their children on religious grounds. Cuomo suggested in a pair of interviews this week that he is unsure the measure would stand up to a First Amendment challenge, though he said his office is currently reviewing the matter. So would eliminating the religious exemption violate the First Amendment’s prohibition against freedom of religion? I doubt it. To begin with, most religious doctrine and rules pre-date the development of vaccines. So those arguing for a religious exemption would have to establish that their religious exemption is based on a sincerely held belief – as opposed to just being upset over government intrusion in their lives. The courts may not declare any religion false even if the overwhelming majority of people do not believe in its precepts or claims. The only relevant measure is whether the individual is acting under “sincerely held beliefs.” Of course, the problem with this formulation is that it is very difficult to judge whether another person’s beliefs are sincerely held. 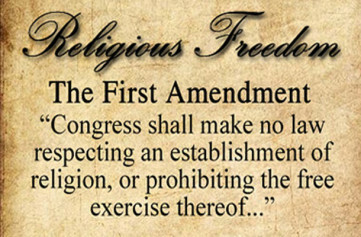 The First Amendment provides: “Congress shall make no law respecting an establishment of religion or prohibiting the free exercise thereof.” These two clauses are referred to as the “establishment clause” and the “free exercise clause.” As with that part of the First Amendment which protects freedom of speech, both of these clauses have been applied to the states, and therefore operate against all levels of government in the United States. The free exercise clause protects the religious beliefs, and to a certain extent, the religious practices of all citizens. The more controversial establishment clause prohibits the government from endorsing, supporting, or becoming too involved in religion and religious activities. Both clauses protect the same values, and often a violation of one would also be a violation of the other. For example, mandatory prayer in schools would constitute an improper establishment of religion and would also interfere with the free exercise rights of those students who did not believe in that particular prayer or prayer in general. There is, however, an inherent tension between the two clauses. If the government goes too far in protecting one, it risks violating the other. For example, if the government refuses to provide certain services (i.e., fire and police protection) to churches, that might violate the free exercise clause. If the government provides too many services to churches (perhaps extra security for a church event), it risks violating the establishment clause. If schools prohibit all student prayer on school property, they may violate the free exercise clause. But if they allow student led prayers during school hours, they may violate the establishment clause. Decisions involving the free exercise clause have not been as controversial as those involving the establishment clause. It is clear that all individuals have an absolute right to hold any religious belief, which may not be interfered with by the government. The problem arises as to what extent the government can control conduct that is based on religious belief. Although the government may not specifically target religious practices, its general restrictions on conduct which are directed at everyone may also be applied to persons engaging in that proscribed conduct for religious reasons. For example, the Court held that laws prohibiting polygamy (the practice of having more than one spouse) could be applied to Mormons, even though they claimed that the practice was required by their religion. Until recently, however, application of such general prohibitions in cases that affected people’s religious practices had to undergo “strict scrutiny.” That is, the state had to show that there was a very important government purpose to the law, which could not be met in other ways. On this basis, the Court struck down a law denying a woman unemployment benefits because she quit voluntarily, when that law was applied to a woman who was forced to quit because she would not work on her Sabbath. In the 1990 case of Employment Division v. Smith, the Court changed positions and held that as long as a law was applied to all persons and was not passed specifically to interfere with religion, it would be upheld even if it significantly affected religious practices. The Court held that the state could deny unemployment benefits to a group of Indians who had been fired for using peyote even though they claimed that it was needed in their religious ceremonies. The state was not required to make any special justifications for the law. Congress tried to reverse the decision in Smith by passing the Religious Freedom Restoration Act. This required states to show a compelling need for any law that burdened a person’s exercise of religion and that the law was the least restrictive means of satisfying that need. The Supreme Court, however, held that the statute violated the establishment clause because its primary purpose was to advance religion. Forced vaccination laws would be analyzed under strict scrutiny through a “free exercise” analysis. Here, a compelling public purpose can be shown – preventing the spread of serious diseases. And there really is no alternate way to protect people from the un-vaccinated. The choice is either force them to vaccinate or prohibit them from entering public spaces. California recently removed its religious exemption from mandatory vaccination and has so far survived the legal fight. The NY Times reports that a study undertaken in November 2018 in California shows that since the exemption was eliminated immunization rates of children entering California kindergartens has risen to an all-time high. The real issue may not be whether the law could survive a legal challenge. Its whether the politicians have the backbone to oppose the powerful and connected Hasidic community. The Ultra-Orthodox Jewish community in NY vote as one large bloc generally and they can effect elections where their communities have a stronghold – in places like Brooklyn and upstate Rockland County. In Southern States, if anti-vaccination continues to become popular among evangelical Christians, politicians there could face the same type of backlash and just decide to duck the issue. The legal battle is already playing out in Rockland County, NY, which passed such a ban on exemptions only to have a judge lift the ban last week saying it was an overreach and that children should not miss school while the legal battle has not been finally decided. We’ll wait and see how that case plays out, though it could just die quietly since the County only passed a 30-day ban which will soon expire. More outbreaks, however, will likely mean more bans, which will mean more court challenges until this issue is finally addressed. That is like saying Trump has a constitutional concern about something. Never happened and never will. Cuomo is a consummate politician in the worst understanding of that phrase. Cuomo has a concern about the Hasidic voting bloc in Brooklyn. He is playing with lives in the general population to appease these nuts. If you don’t want to vaccinate then go live in a cave because you do not have the right to put the general public welfare at risk. I fear Cuomo and other politicians won’t act until more cases appear in the general population and every single such case will be on their heads. Shameful behavior and par for the course for most of our politicians.